B. Thomas (Arlington, Texas, United States) on 3 March 2013 in Landscape & Rural. Another Sunday, another beautiful island church on Moorea. 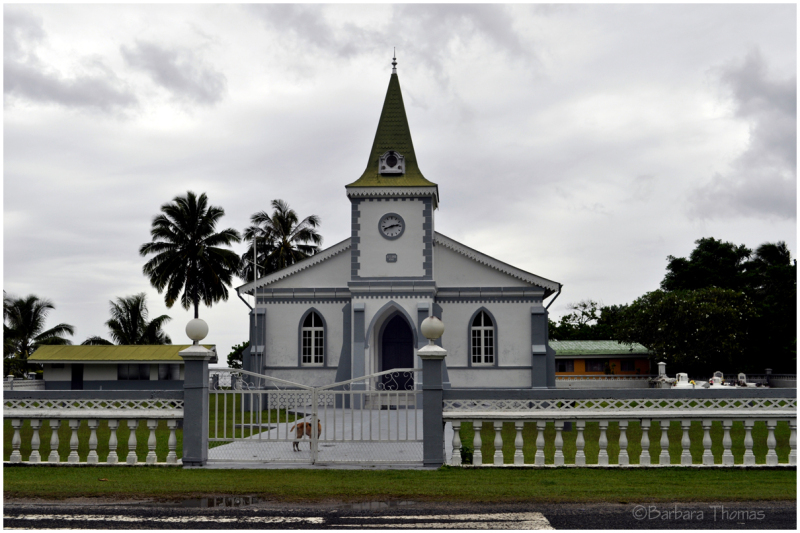 This old church on the South end of the island in Haapiti, Moorea, was the first Protestant church on the island. **Trip to the South Pacific - French Polynesia Society Islands of Tahiti, Moorea, and Bora Bora. This has been on my "Bucket List" of places I wanted to visit for a long time. Terrific picture of this church and I especially like the 'guard' they have inside the fence! A very nice setting. The grounds look well kept. a stately building on attractive grounds ... but i looks closed down !!! Ein ganz besonderes Bauwerk ! THere is a beautiful symmetry in this lovely image. Je suis frappée par la blancheur des trois églises. Elles sont très belles !